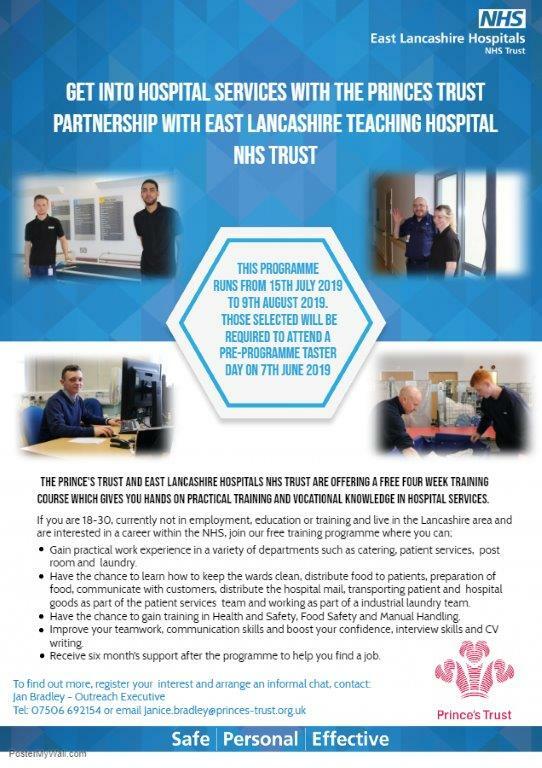 I am delighted to inform you of our new Get Into Hospital Services course with Royal Blackburn Teaching Hospital and The Princes Trust. Due to the continued success of this course we are able to offer it again. This programme is aimed at young people who are aged between 18 and 30 inclusive who are currently not in employment education or training. This 4 week programme is designed around gaining practical experience within facilities management within a hospital setting and helping young people with their employability skills. Placements will be at Royal Blackburn Hospital and Burnley General Hospital. Once young people are in a placement they will spend the 4 weeks within that department and not rotate so it will give them plenty of opportunity to learn about that department. Young people will also have the opportunity to work on their CV and interview skills whilst on the programme with Princes Trust staff, as well as training in food hygiene (if placement is in catering), manual handling and patient care. Young people will also need to pass a DBS and a health check prior to starting the programme, and will be asked to bring certain documents to the taster day. There is no charge to young people for the DBS check. This is a really exciting opportunity for young people who would like to work in a hospital environment in a variety of roles. Everyone who completes the course will also be supported for up to 6 months after the course. ► Taster Day is on Friday 7th June at Royal Blackburn Hospital. ► Course dates Monday 15th July to Friday 9th August. In order to avoid young people being disappointed that they cannot complete their chosen placement, because it can take a few weeks for young people’s DBS clearance to come through (and they need this to do the placement) we have made the decision to leave just over 5 weeks between the taster day and the start date, as we found on the previous courses there was not enough time to gain clearance in some cases so some young people could not do their chosen placement. Young people who successfully complete the course may get the opportunity to be placed on the hospital bank staff list leading to possible employment. To refer a young person to this course please fill in the attached referral form and email back to Jan, or for more information please contact Jan Bradley on 07506 692154 or email Janice.bradley@princes-trust.org.uk. Young people are also able to self-refer to the course by contacting Jan or via our website.